The Racing Journalists Trophy saw a dramatic finish with favourite Between the Waters (Surfrider – Althing, Ruia Stud) and Juno’s Guest (Arazan – Queen’s Guest Poonawalla Stud) involved in a dead-heat. The race got hotter once Gold Field led them into the straight with Rising Brave putting up a good fight. Between The Waters, with Trevor guiding the Sunderji ward started to close in on the pair in front. At the same juncture, apprentice jockey AS Peter astride Vinesh trained Juno’s Guest was caught behind the wall of these three runners. By the time he skirted around to get the clear passage, Between the Waters had taken charge and was charging towards the winning post that was less than 100 meters ahead. Juno’s Guest started to inch closer and picked up good speed and made a fiery final dash to catch up with Between the Waters just at the right time to share the honours as they zipped past the wire in absolute sync. The Judge, understandably took his time and it was not too surprising when he declared a dead-heat between the two. Rising Brave produced his best and was rewarded with the pace money. Gold Field too did reasonably well to end up close in the frame. Dance The Dream (Western Aristocrat – Breeze and I, Nanoli Stud) made it clean as a whistle without encountering any challenge, fully justifying the strong support the Imtiaz Sait trained filly received in the betting. Jetfire had a handy lead in the straight and kicked on until approaching the distance post. Tasch and Dance The Dream made their move together and both got past Jetfire with ease. Dance the Dream soon picked up momentum and jockey A Sandesh rocketed ahead in the final furlong to leave Tasch well behind and post a very comfortable victory. Cupido ran on well towards the end and collected the place money. Pesi Shroff trained Rhapsody (Speaking of Which – Analeah, Usha Stud) was backed with conviction to triumph on debut, but the filly did cause some anxious moments before benefitting from an erratic run by another rookie -Monk. Rhapsody moved from the third spot to get past the front runners soon on turning for home, while Monk was not in the first seven. Rhapsody was ahead past the distance post when Monk started to bridge the gap at a good clip. He was on hot pursuit, but just at a crucial juncture Monk veered outward and in the close finish that ensued, this proved costly for Monk. Jockey P Trevor pushed hard to grab the chance and ensured that he hung in there to carve out a narrow victory on debut for Rhapsody. Monk missed out by being erratic but caught the eye with his game first essay. Speculator did well to finish in the money. Golden Guest (Excellent Art – Queen’s Guest, Poonawalla Stud) put in a creditable performance to shed his last start disappointment and provide a much improved run to get the taste for his first victory. He got past The Cheetah soon and led them into the straight. The Cheetah was right behind and trying hard to stay close to Golden Guest. However, hot favourite Bait And Switch could not muster enough and failed to produce any worthwhile challenge. 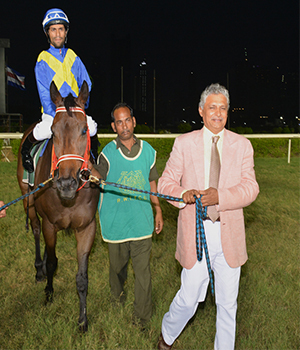 Golden Guest, trained by Dallas Todywalla and well-ridden by Sandesh, coasted to victory by about two and half lengths over The Cheetah. Bait and Switch ended a tame third. Justified (Multidimensional – Secret Garden, Usha Stud) was another one to notch up a maiden victory. Settling well off the pace early on, Justified improved positions and was in striking third as Dumas led comfortably as they straightened up for home. Dumas had a good lead and was striding well too, however, the long Mumbai straight took its toll as Dumas started to tire out in the final furlong. Favourite Conscience too was labouring all through and was getting nowhere. Justified piloted by S Zervan ate up ground at a good rate and collared the leader in the final 150 meters to surge ahead and post a comfortable victory. Dumas held on to finish second ahead of Conscience. Whoopsiedaisy (Chevalier – Expelliarmus, Ruia Stud) made it this time after a couple of failed attempts of his start-to-finish missions. This time too it looked as if she would give it away after leading all the way when Master of Studies arrived with a game challenge. The duo fought hard and long going neck and neck in the last 200 meters. Apprentice jockey AS Peter showed grit and resolve and kept going all the way and succeeded in warding off Master of Studies with a determined show. Grand Eyes ran on to finish a faraway third. Rehanullah Khan’s Dazzling Star (Multidimensional – Dazzling Skill, Usha Stud) finally added to his debut win this time sustaining all through in his start to finish essay. He had a handy lead coming into the straight with Strong Storm, who was close second. not looking too convincing. Princess Eliza improved positions and came up with a strong challenge and shaped well approaching the distance post. Dazzling Star was not one to give up and jockey A Sandesh rode out strongly all the way to thwart the game challenge that Princess Eliza offered. Princess Eliza however, drifted out under pressure in the finishing stages and that wiped out all hope for the favourite. Dazzling Star held on determinedly and pocketed the concluding race of the day by a narrow margin. Strong Storm ended a poor third. For the professionals, jockey A Sandesh was the star of the day booting home three winners, while trainer Imtiaz Sait and jockey P Trevor scored a double each.